* Sunday, December 2 is a testing day, each student will only need to attend some of the hours. The required attendance hours for each student for December 2 will be determined in early November with priority given to long-distance travelers. 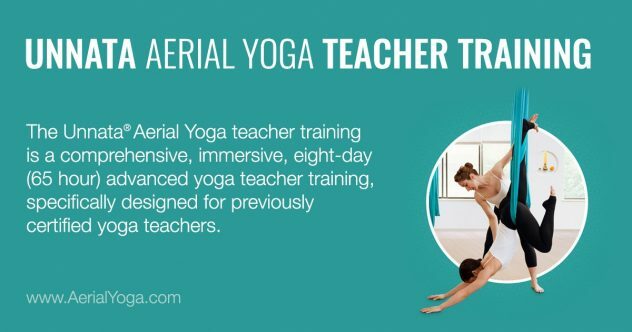 To receive a teaching certificate, you must have completed both Part 1 and Part 2 of the Unnata® Aerial Yoga Teacher Training program in Carmichael, CA. This course also qualifies for 63 contact hours of continuing education with the Yoga Alliance. Please contact Carmichael Yoga at carmichaelyoga.com for more details on course location. Jordan Anderson is a yogi and aerial acrobat, and the co-founder and director of Aerial Fit® which is Charleston, SC’s only dedicated aerial facility. She was a dedicated yoga practitioner and instructor for many years before discovering aerial, and the Unnata® Aerial Yoga method speaks to her because the way it combines yoga with the use of an aerial apparatus is so powerful. Jordan has been influenced by a variety of yoga teachers including Doug Keller for his down to earth anatomical approach, Andrey Lappa for his inclusion of the energy bodies in the practice, Dharma Mittra for his kind heart, and all of her students and teachers who continue to be her greatest inspiration. Her yoga classes are a combination of breath, movement, stillness, focus, and exploration/play. She is a firm believer that the practice of yoga (all 8 limbs of it!) can enhance anyone’s quality of life. 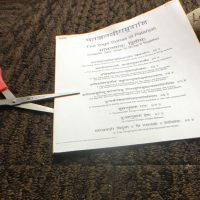 As someone who spends much of her life in the air, Jordan is drawn to Unnata® for the sense of grounding it provides and loves how it bleeds over into every aspect of her life. Teaching is her way to share that with others. Jordan has been teaching Unnata® since 2009 and has a passion for helping guide others along the teaching path. Michelle Dortignac, founder of Unnata® Aerial Yoga, is a certified Yoga instructor of over 20 years, while during most of those years also being a professional aerial acrobatics performer. Her most influential Yoga teachers include Dharma Mittra, Alan Finger, Cyndi Lee and Susan Braham. 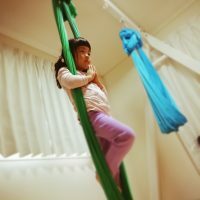 Since its inception in 2006, Unnata Aerial Yoga has been influential in the growth of popularity of the aerial yoga genre. With more than 200 Unnata Aerial Yoga teachers spread worldwide, the Unnata Aerial Yoga Teacher Training program has become known for its exclusive and high-quality training. Participants receive large amounts of personalized instruction, and graduates receive a great amount of continuing support.